Introduction to fibre structure; Testing and sampling; Fibre fineness and transverse dimensions; Fibre length; Fibre density; Thermal properties; Equilibrium absorption of water; Heats of sorption; Rate of absorption of moisture; The retention of liquid water; Swelling; Theories of moisture sorption; Tensile properties; The effects of variability; Elastic recovery; Rheology; Directional effects; Thermo-mechanical responses; Fibre breakage and fatigue; Theories of mechanical properties; Dielectric properties; Electrical resistance; Static electricity; Optical properties; Fibre friction. First published in 1962, and now in its fourth edition, Physical properties of textile fibres has become a classic, providing the standard reference on key aspects of fibre performance. The new edition has been substantially reorganised and revised to reflect new research. After introductory chapters on fibre structure, testing and sampling, the book reviews key fibre properties, their technical significance, factors affecting these properties and measurement issues. Each chapter covers both natural and synthetic fibres, including high-performance fibres. The book first reviews properties such as fineness, length and density. It then considers thermal properties and reaction to moisture. A further group of chapters then reviews tensile properties, thermo-mechanical responses, fibre breakage and fatigue. Finally, the book discusses dielectric properties, electrical resistance and static, optical properties and fibre friction. 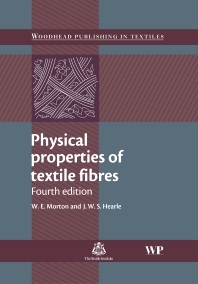 Written by one of the world’s leading authorities, the fourth edition of Physical properties of textile fibres consolidates its reputation as a standard work both for those working in the textile industry and those teaching and studying textile science. J. W. S. Hearle, M.A., Sc.D., Ph.D., C.Text F.T.I (Hon. ), F.Inst.P, is Emeritus Professor of Textile Technology in the University of Manchester, UK. W. E. Morton, M.Sc. Tech., F.T.I., was Professor of Textile Technology in the University of Manchester from 1925 to 1966.